In an interview with the Associated Press during a Labor Day campaign swing through Iowa, Hillary Clinton remained unapologetic regarding the use of her private emails and server while she conducted work as the Secretary of State. She claimed “what I did was allowed” and that this was nothing more than a “distraction.” REALLY, so the feds investigate things that are allowed and distractions? NO, WHAT YOU DID WAS A CRIME. Also, her drop in the polls is a direct result of her scandals. 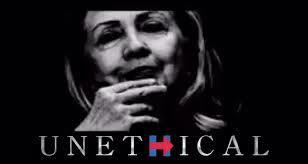 Hillary also said that she plans to reintroduce herself to the American people. How does that go Hillary, no my name isn’t Hillary Rob ‘em Clinton and I am not a complete lying sack of garbage? Something like that? She cannot even admit the truth that her campaign has been hurt be the email/server scandal. How else would you explain that self-proclaimed socialist Bernie Sanders now leads her in New Hampshire and when voters are asked what words best describes Hillary Clinton, they say liar. Sorry, this woman belongs in leg-irons, not the presidency. In an interview with The Associated Press during a Labor Day campaign swing through Iowa, the front-runner for the Democratic presidential nomination also said the lingering questions about her email practices while serving as President Barack Obama’s first secretary of state have not damaged her campaign. Yet even in calling the inquiry into how she used email as the nation’s top diplomat a distraction, Clinton played down how it has affected her personally as a candidate. As she has often said in recent weeks, Clinton told AP it would have been a “better choice” for her to use separate email accounts for her personal and public business. “I’ve also tried to not only take responsibility, because it was my decision, but to be as transparent as possible,” Clinton said. Part of that effort, Clinton said, is answering any questions about her email “in as many different settings as I can.” She noted she has sought for nearly a year to testify before Congress about the issue, and that she is now slated to do so in October. The one-on-one interview with AP was the second for Clinton in the past four days. On Friday, she did not apologize for using a private email system when asked directly by NBC, “Are you sorry?” Asked Monday by the AP why she won’t directly apologize, Clinton said: “What I did was allowed. It was allowed by the State Department. The State Department has confirmed that. Clinton’s efforts to address the email issue comes as her chief rival for the Democratic nomination, independent Vermont Sen. Bernie Sanders, exits the summer surging in still-quite-early public opinion polls and drawing massive crowds to his rallies and events. If Hillary Clinton was a Republican the MSM would be calling for her to be put in the stocks. RUT-ROH, Looks like George Zimmerman may be in trouble again. According to Jacksonville attorney John Phillips, who represents photographer Rick Wilson, George Zimmerman committed a copyright violation of his clients photo of State Attorney Angela Corey. The AP owns the rights to the photo. AP has sent George Zimmerman a cease-and-desist letter for the use of this photo. AP spokesman Paul Colford stated said that Zimmerman, “clearly directly copied an AP photo to create his painting of Florida State Attorney. Zimmerman planned on selling this paining on line as he did his previous one did on eBay, with a winning bid of $100,099.99. The new painting is an image of Corey gesturing with her finger and thumb together, under the words “I have this much respect for the American judicial system.” The painting is titled “Angie,” Robert Zimmerman Jr. tweeted Wednesday. Following the trial,Law School Professor Alan Dershowitz said George Zimmerman special prosecutor Angela Corey should be disbarred and her conduct bordered on criminal conduct. Zimmerman’s defense attorneys did not have very many kind words for the prosecution either. Looks like Zimmerman wanted to get even with a completely unflattering painting. A photographer and news agency whose picture of State Attorney Angela Corey appears to be the basis for George Zimmerman’s latest painting are calling the artwork a clear copyright violation. Jacksonville attorney John Phillips, who represents photographer Rick Wilson, told the Orlando Sentinel on Friday that Zimmerman should expect legal action if he continues to use the photo. Wilson said he took the photograph as a freelancer for The Associated Press, and he said AP owns its copyright. In a statement Friday, AP spokesman Paul Colford confirmed the news network has sent Zimmerman a cease-and-desist letter. Zimmerman “clearly directly copied an AP photo to create his painting of Florida State Attorney Angela Corey,” Colford said. $100,000 for a Zimmerman paint by the numbers painting, ARE YOU SERIOUS? That might be criminal as well. MEDIA-GATE … MORE FROM THE MOST TRANSPARANT ADMINISTRATION EVER. And the scandals and lies keep coming from the Barack Obama administration. As reported at NBC, Attorney General Eric signed off on the search warrants to investigate FOX News James Rosen as a “possible co-conspirator” in violations of the Espionage Act. But wasn’t it President Barack Obama who said that kind of thing didn’t happen in his administration and he was for a “Free Press”? Barack Obama said, “Journalists should not be at legal risk for doing their jobs.” REALLY? How can Obama say he is against the targeting of journalists and have top ranking officials in his department doing just that? Obama claims there will be an investigation into these issues so that they never happen again. WHAT? As stated at Powerline, “Whenever he has addressed the issue, he has cited his own support for a media shield law as if that were somehow exculpatory.” The overreach of seizing media records from the AP and Fox News, of course this is only what we know of at this point, was done and approved by Obama’s DOJ. Let me guess, Obama didn’t know about this either. Is Obama the President? How come he can’t just say to individuals in his own administration to stop the nonsense? I thought Obama was supposed to be the smarted president ever? Guess not. 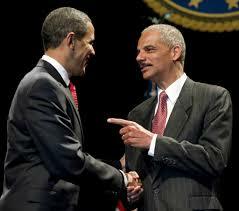 The Gateway Pundit adds, Holder Lied to Congress On His Role in Investigating News Reporters. Watch the VIDEO. The Obama administration has no shame. They really believe that no one is going to hold them accountable for their actions. It’s up to you America, are you? But wait don’t worry, the Lonely Conservative opines, “Oh, but not to worry. President Obama has instructed Holder to investigate himself, so I’m sure nothing like this will ever happen again.” Yes, sarcasm is included! At this point we might as well have an independent investigator looking at every aspect of the Chicago style politics of Barack Obama. Every thing they have done has been questionable, meant to intimidate and against the Constitution. What a joke the Obama administration has become and sadly. ultimately the joke is on “We the People” and the “US Constitution”. Exactly how is Eric Holder not asked to resign? All this as we head into Memorial Day where we honor those who have made the ultimate sacrifice to fight against tyranny and uphold the United States if America and the US Constitution. If the following is true regarding the AP telephone record reporting scandal just got huge. 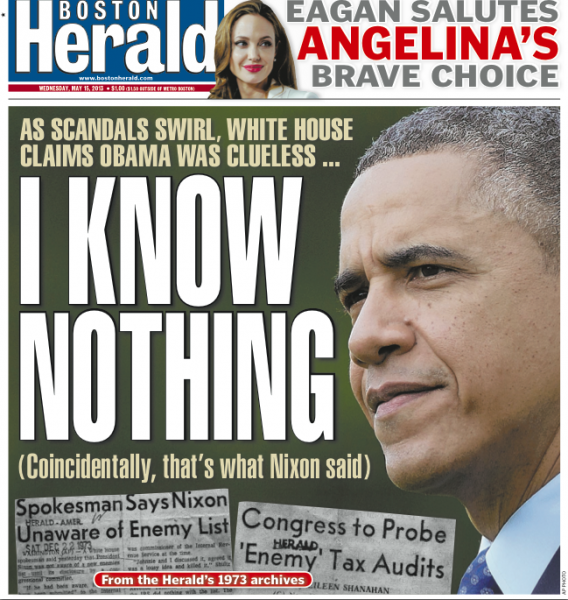 As Hot Air asks, “Would you believe that the [Obama] Administration Got Phone Records of The House Of Representatives? Those were the comments and revelations made by California Congressman Devin Nunes, who sits on the House Ways And Means Committee while being interviewed on the Hugh Hewitt’s Show Wednesday night. That is correct, Congressman Nunes said that the DOJ’s recording of AP telephone calls also included the House of Representative Cloak Room. Unbelievable, no separations of powers issue here, now is there? America, are you starting to see a pattern of behavior by the Obama administration and a lack of caring of the US Constitution … First Amendment rights issues in IRS-gate of intimidating Americans, Freedom of Press issues with AP scandal, separation of powers issue with AP and flat out lying to “We the People” on Benghazi. 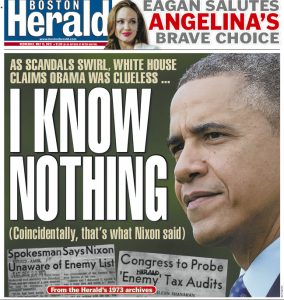 And Barack Obama would have us believe, HE KNEW NOTHING. DN: … members of Congress talk to the press all the time. HH: I did not know that, and that is a stunner. DN: Now that is a separation of powers issue here, Hugh. DN: And it’s a freedom of press issue. And now you’ve got the IRS going after people. So these things are starting to cascade one upon the other, and you have the White House pretending like they’re in the clouds like it’s not their issue somehow. UPDATE I: As Powerline states … THIS JUST GOT REAL. I’ve been skeptical if not dismissive of all the loose talk that the multiple scandals piling up around Obama would be sufficient to bring about his impeachment–until this afternoon. Let’s remember that impeachment didn’t work out too well with Clinton, and the evidence of his bad behavior was a lot more direct than it is (so far) with Obama. In the case of Nixon, it will be recalled, it required a tape recording of his collaborating in the obstruction of justice to bring about the tipping point that doomed his presidency. But for that tape, he might have been able to tough it out as Clinton did. Is it true, has DC turned on Barack Obama … Can You Say Watergate II? 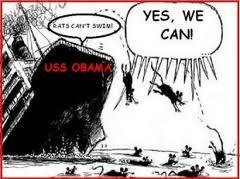 Are the rats jumping off the SS. Obama? With the Obama administration facing three scandals simultaneously, Benghazi-gate, IRS-gate and AP-gate, the good ship Democrat S.S. Obama is looking more like the RMS Titanic these days. Barack Obama is beginning to make Richard Nixon look like a choir boy. But what did everyone expect, Obama’s “Chicago-style” politics has been taking place for years. It is only now that the MSM is being forced to cover it and Democrats are forced to acknowledge it. Democrats are fleeing the ship and the liberal MSM seems not far behind. So is as the Politico asks, has DC turned on Obama? I am not sure if I buy some of the Politico premise that the “establishment” Democrats and the MSM did not like Obama. Sorry, they have bent over backwards for this man and shoved legislation like Obamacare down the throats of Americans. The MSM has carried the water for this president and had they done their job, as they are being forced to now, Barack Obama may never have been elected in 2008 and definitely not in 2012. Democrats are fleeing Obama because “The One” is a lame duck, second term president with no more elections. However, Democrats who want to stay in power see Obama and his far too many scandals as an anchor. The MSM, after all the propaganda that they have spewed on to “We the People,” the AP scandal has forced them into a “come to Jesus” moment. Suddenly, the folks that made Obama have been slighted, more than normal by this administration. The MSM has suddenly realized that they have been defending Richard Milhous Nixon. The one thing that rings most true in all of this is that Conservative and Tea Party folks have been vindicated in their complaints about President Barack Obama and his administration. The Left, Democrats and the MSM can no longer say their accusations are unwarranted and that they are just acting with partisan “sour grapes”. They were targeted and it is a fact … “NOT IF”. But suddenly Obama seems to have amnesia and has become Sgt. Schultz as he “knows nothing” of any of the scandals. With Democrats and the MSM turning on Obama it should make for a good reality TV … ‘When Libs attack One Another.’ Gone is defending Obama and his agenda at all cost as it might just cost Democrat House and Senate politicians their political career. The 2014 and 2016 elections are not that far off and self-preservation is the name of the game in DC. To make matters worse for Democrats, the front-runner Hillary Clinton does not have clean hands either. UPDATE I: More from Instapundit on President Barack Obama knowing nothing and doing his best imitation of ‘Hogan’s Hero’s’ Sgt. Schultz … As it turns out, that is exactly what Richard Nixon said as well. So what is worse, a president with three scandals he is complicit with, or a president that has no control of his administration and is completely over his head? Both are damning to America.